One stop solution for Uniform Manufacturing in UAE and the Middle East. TSI Apparel - Uniform Company of TSI International. We provide one window solutions to Uniform Clothing in UAE - with custom made uniforms - complete branding of company uniforms with logo & color schemes. We invite you to Create your style, with us! order custom uniforms - how does it work? Send us an enquiry & your designs OR choose from our design templates OR we develop custom uniform designs for you! We discuss and finalize the design, color, sizes, fabric and quantity of uniforms required. Come to an agreement on T&C. 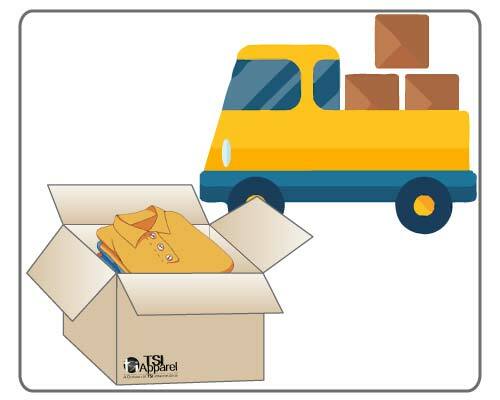 We manufacture and deliver your uniforms to you at your place of choice & on-time. Well packed and ready to wear. Search across our wide collection and find the specific uniform you need. Even if you don't find what you are looking for, be rest assured we still make it. Please don't hesitate to contact us. We are privileged to have created uniforms for hundreds of companies. Browse through our wide collection of Uniforms, work with us and see why TSI Apparel is the best uniform manufacturer and supplier in UAE! This must be the easiest 5 Star rating i have ever given to a company. The team at TSI has always supplied exceptional quality garments at the most competitive price, and have always kept to their promise on their deliveries. I am more than happy to recommend TSI for all corporate uniform, T-shirt requirements. Read our Customer Reviews to learn more if you have not worked with us before. TSI Apparel is a one stop solution in the uniform world for companies, who want to make their own customized uniforms with unique designs, logo printings & embroideries as well as customized home textile products. Our wide range includes Corporate Uniforms, Industrial Uniforms, Hospitality Uniforms, School Uniforms, Sports Uniforms, Bed & Bath Textiles. We also supply promotional items, flags and national day wear.